Looking for restaurants in Fond du Lac and want to go to the best place for lunch or dinner with the family, with a group of friends ? Yummy Bones BBQ is unlike other Fond du Lac restaurants with a flavor distinction you won’t find elsewhere. Inspired by his southern Mississippi roots Pitmaster, Robert Meredith, introduced barbeque to Wisconsin in 2014 and just like a good backyard picnic, people came back again and again. Yummy Bones is Wisconsin owned and locally operated. You can search restaurants near me in and around Fond du Lac but you’ll want to try Yummy Bones Barbecue located on North Macy Street, a couple of blocks from Lakeside Park and Lake Winnebago. Located near main street and downtown markets festivals, or if you're enjoying the recreation of the lake, we’re a perfect spot to stop for lunch or dinner or after a day of boating, fishing, working, or just hanging out. Every day’s a good day for barbecue! Order-online for quick and easy pickup or dine-in. 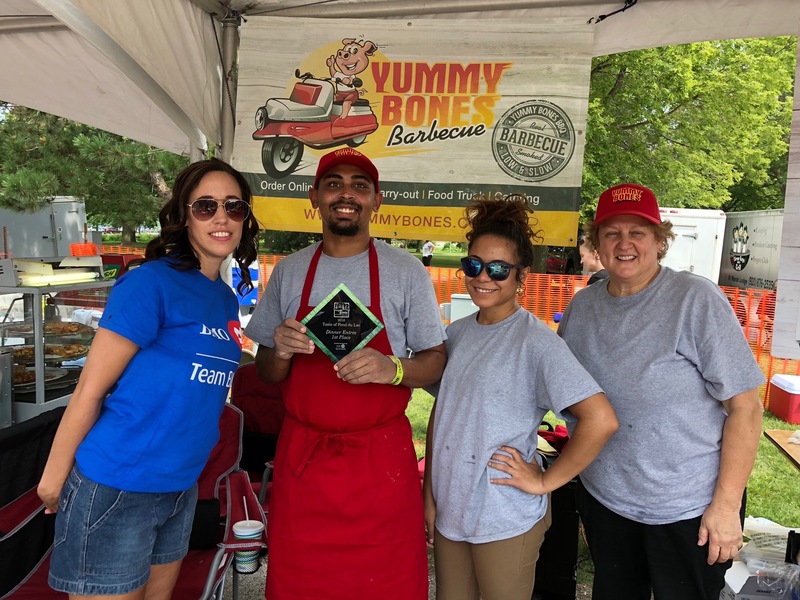 Taste of Fondy: Best Sandwich Award 2018! Taste of Fond du Lac is a tradition of food and fun for all ages. The food and beverage selection at Taste of Fond du Lac is diverse and delicious, ensuring everyone's taste buds are satisfied! "Taste of Fond du Lac is a feast for your senses ... you smell the food, see the food, taste the food and drink, and listen to the music. It’s a laid-back festival allowing you to savor the flavor of summer and good food," said Leanne Doyle, executive director for Fond du Lac Festivals, Inc.
And guess what? We won the Best Sandwich Award. Serving Pitmaster Robert Meredith’s Famous Smoked BBQ Southern Sides. Delicious, southern inspired flavors to enjoy for lunch or dinner with the family. What's better than an outdoor venue? One with a Yummy Bones BBQ!